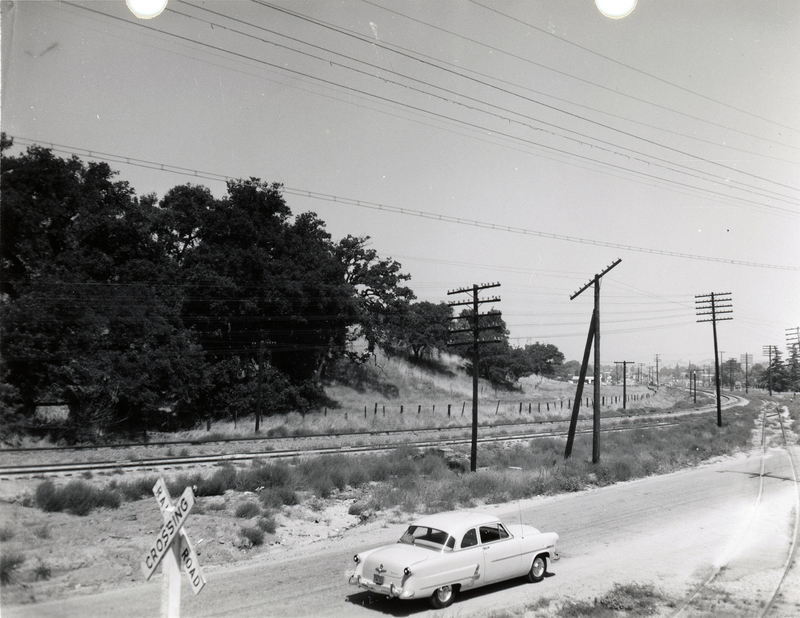 SCVHistory.com HS5802 | Hart Park | County Report: Intent to Purchase Frew Addition (Future Heritage Junction), 7-18-1958. Board Report: Intent to Purchase Frew Addition to Hart Park (Future Heritage Junction). Robert B. Heyer, Director, Los Angeles County Department of Real Estate and Property Management. Los Angeles, California | July 18, 1958. See also: Survey of William S. Hart's Newhall Property Acquisitions (& Subsequent). 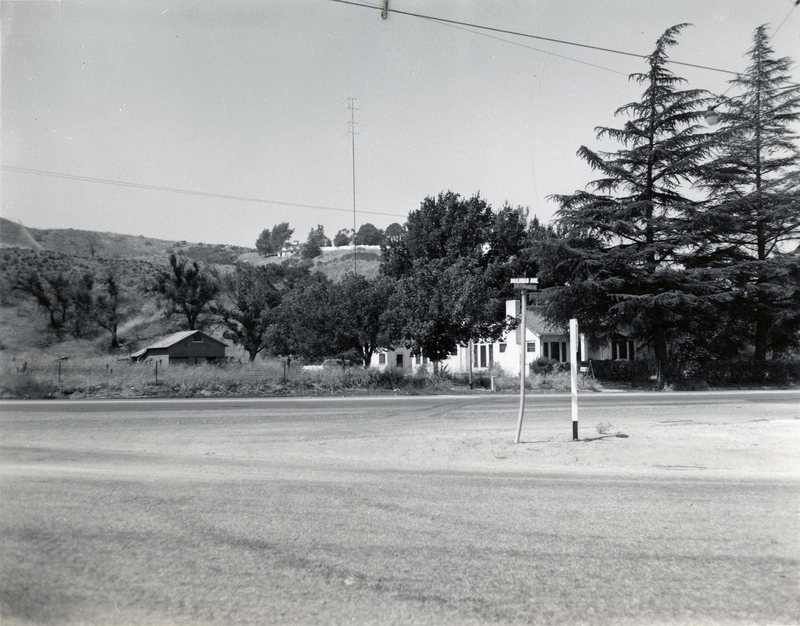 Report from the director of L.A. County's real estate and property management department, with original photographs (below), seeking approval from the Board of Supervisors for the purchase of a 23.86-acre addition to William S. Hart Regional Park in Newhall from the Frew family for $82,500. The purchase was effective two months later on Thursday, September 18, 1958. Included in the transaction were a house and barn; according to The Signal (below) the house had been occupied since 1907 by Thomas McNaughton Frew II and his descendants. Frew (1852-1928), a native of Scotland, arrived in Newhall in 1900 and immediately became the town blacksmith, the previous one having recently died. 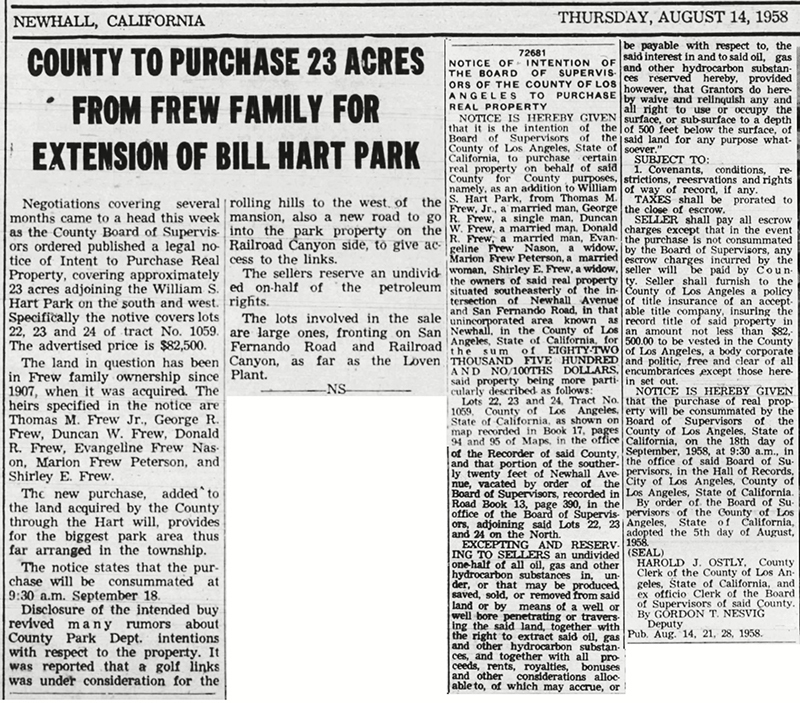 Hart Park was dedicated Saturday, September 20, 1958 — two days after escrow closed on the "Frew property," as it is known locally. As noted in the report, the Frew addition was indended primarily for parking and for "other proposed developments ... which cannot be placed on the present park property." The other park property, which the county received August 1, 1957, had belonged to William S. Hart (1864-1946) and came with binding restrictions set forth in Hart's will. The Frew property had no such restrictions and was thus more versatile. The Frew house became the county park office. 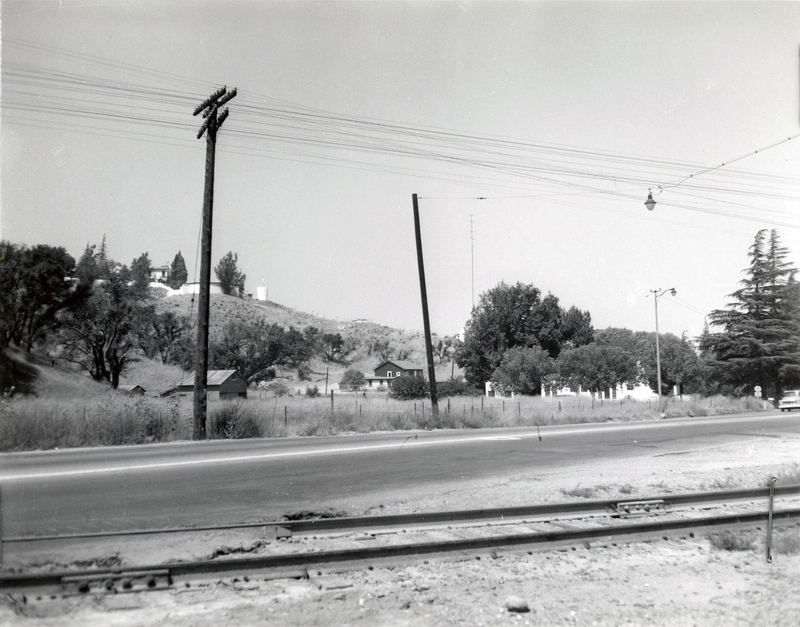 Most of the remainder of the Frew property, 22 years later, would become Heritage Junction Historic Park — home to local historic buildings saved from demolition by the Santa Clarita Valley Historical Society. Sellers of the property were Thomas M. Frew III (aka Thomas Frew Jr.), George R. Frew, Duncan W. Frew, Donald R. Frew, Evangline Frew Nason, Marion Frew Peterson and Shirley E. Frew. The family retained an undivided one-half interest in the petroleum rights. 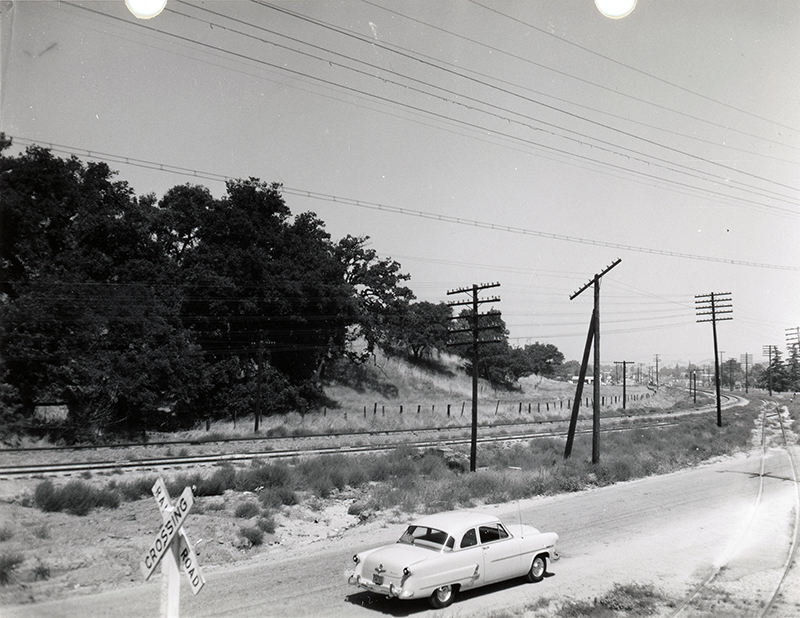 "View of southeast portion of property from across Southern Pacific Railroad tracks." Click to enlarge. "Dwelling and barn on subject property looking southwesterly across San Fernando Road." Click to enlarge. "Looking west at north end of subject property from intersection of San Fernando Road and Southern Pacific Railroad tracks. Hart estate buildings on hill in background." Click to enlarge. HS5802: Download individual pages here. Courtesy of Cynthia Harris, 2018.